An intense fascination for the Orient was the largest influence on stylistic change at the turn of the century. 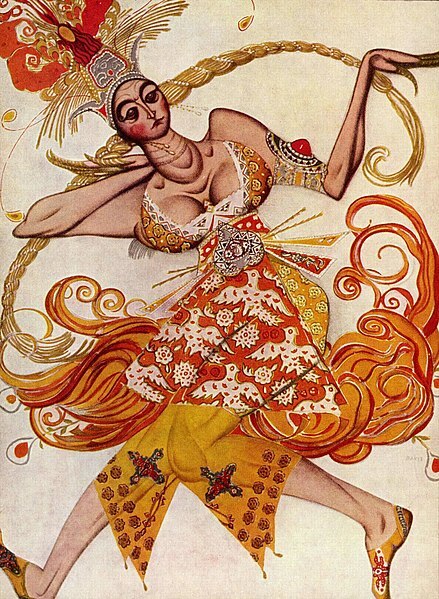 The Ballets Russes was first performed in Paris in 1909, and quickly became a blockbuster sensation across Europe. Dancers performed oriental tales, dressed in brightly colored costumes of unprecedented combination. The designs, like that to the left, were originally created by Leon Bakst. It was the first time that a theater event had any major impact on the way we dress. Consider how great the impact of celebrities -actors, sports stars, musicians, etc.- is on fashion now! While Charles Worth was catering to upper-class women, Jacques Doucet (1853-1929) was designing stage sets and dressing actresses. Young designer Paul Poiret (1879-1944) worked for Doucet in this regard, until he gave away a design model to a young actress, who had the pattern realized by another designer. (This is one of the first of MANY cases questioning the copyright of a fashion design.) He then went on to work at the House of Worth. Worth’s legacy had been 19th century dress. After his death in 1895, his two sons were unsure of how to move his style forward (this is the first case of a fashion house having to carry on without their namesake). Poiret presented them with a new style, which was rejected as low-class by Worth’s heirs (if you think this sounds like Marc Jacobs’ 1992 grunge collection for Perry Ellis, which got him fired while rocketing him to superstar status, you are catching on… history does repeat itself). Poiret then went out on his own. He was a marketing genius and focused on window displays, adding shock value by giving them a theatrical stage quality to get attention. The Poiret dress had no crinoline, no corset and was more tubular than S-shaped, with a higher waistline. However, the corset did not completely disappear; Poiret’s dresses still needed undergarment support, though not as tight. The fabrics were in brighter, happier colors than Worth’s sober patterns. Aside from helping to free women from the corset and crinoline, Poiret’s greatest contribution to the fashion world was his attention to the means of communication and diffusion for his creations. As fashion magazines were often too sober for his colors, Poiret started a cooperation with young artists, Paul Iribe (right) and Geirges Lepape, to draw his dresses. Again, we are seeing here another first example: this time of an in-house marketing team. Poiret went further to create a symbol (trademark) of his maison: the rose. 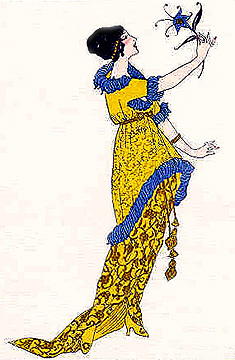 This would not only serve as his logo, but the pattern would be incorporated into many of his designs, such as the famous Joséphine dress (1907), named for the Empress Joséphine. He generally paid more attention to the overall effect than to the fine details of dress construction, and threw a huge party to sell something more than a dress, but rather, a dream. The Féte de la Mille et Deuxiéme Nuit was the name of Poiret’s 1910 traveling party, in which he toured his models throughout Europe. The traveling party was Persian-themed with authentic props, decoration, musicians and so on. Guests came in Persian costume, creating a buzz and word of mouth marketing for the house, which led to mass attention from the press and the world. This was followed by a US tour in 1913. Poiret was also the first to extend his brand beyond fashion, into perfumes, cosmetics and furnishings (brand extension). As many ground-breaking brand strategies as Poiret introduced into the fashion industry, he could very well be considered the godfather of modern fashion branding. For a great article on Poiret, check out this article at style.com: Fashioning the Century.